Known for her decades-long engagement with materials and process to suggest content, Hammond continues to have a second on-going series of more overtly political work. “Erasing Censorship” will be the most recent variation in a series of exhibitions of the same name dealing with voice, intolerance, censorship and self-censorship, contributing to an ongoing narrative which unfortunately remains all too relevant today (previous exhibitions were at the Durand Art Institute, Lake Forest College, IL in 2007 and Left Coast Books, Goleta, CA in 2011). “Erasing Censorship” at Artist Curated Projects in Los Angeles will include A Queer Reader, a suite of Portraits, Erasures I and II, and Bandaged Grid #5. In 2001, the staff of the James C. Hormel Gay and Lesbian Center at the San Francisco Public Library began finding books carved with a sharp instrument hidden under shelving units. Over 600 books relating to issues of gay, lesbian, bisexual and transgender individuals as well as AIDS and women's health issues were vandalized. Eventually, the vandal was caught and charged with a hate crime. James Van Buskirk, the librarian, sent the damaged books to artists around the country with instructions to make works of art using the damaged books - thereby transforming the destructive acts into creative acts that both acknowledged and reversed the vandalism. These works were exhibited at the Hormel Center and other venues. In 2003, Hammond scanned the vandalized book jacket of A Queer Reader: 2500 Years of Male Homosexuality, edited by Patrick Higgins (New York: The New Press, 1993 Book Jacket Design After: The Senate) that incorporated the photograph Le Marin (Philippe Gaillon, 1985) by Pierre and Gilles, two French photographers who work as a team and are well known for their highly stylized and heavily retouched performative portraits of gay male archetypes. Eliminating the subtitle and name of the editor, she shifted the word “reader” from the book to the sailor or possibly the viewer or one who is reading, and enlarged the resulting image to movie poster proportions (66 ¾ x 44”). A Queer Reader was first exhibited in the “spin-off” exhibition “Insight Out: Reversing Vandalism” at the Center for Contemporary Arts, Santa Fe (June 4 – July 5, 2004). In 2010, a second edition, measuring 43 x 29” was printed on Museo Silver Rag paper. One of these latter archival inkjet prints is included in this exhibition. 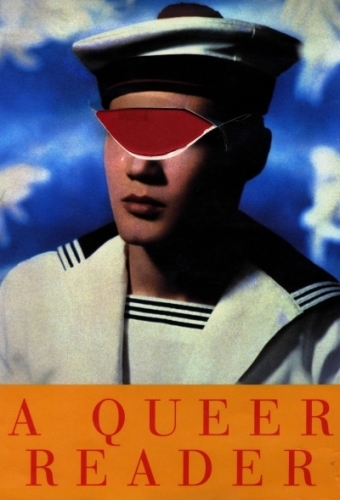 Is the sailor a queer who reads? With his eyes cut out like Cyclops, he is not allowed to see or read at all much less queerly. Why the fear of queer eyes? The vandalism is a violent act of censorship that calls into question the sexuality of the perpetrator….. his fears of being seen or read as queer and suggests mythological themes of blinding and self-blinding. Pierre and Gilles’ idealized sailor is all lipstick, rosy, and sanitized in contrast to queer realities of AIDS, gay bashing, anti-human rights initiatives, and censorship. Hammond's digital print of the “cut”, forces the icon and the image to address homophobia and censorship. The vandal cut the same eye shaped hole on the pages inside the book. A suite of Portraits repositions suggestive texts by gay male authors included in the anthology, the earliest being Oscar Wilde, and the most recent, Allen Ginsberg so that they are partially seen through the orifice. Six of the original seven Portraits are included in this exhibition (E.M. Forster, W. H. Auden, Jean Genet, Tennessee Williams, Ned Rorem, Allen Ginsberg). Hammond considers A Queer Reader, the Portraits, and the Erasures to be in conversation with her signature thick near-monochrome paintings of the last fifteen years which participate in the narrative of modernist abstraction at the same time they insist on an oppositional discourse through “material engagement”. In Bandaged Grid #5, a small mixed media painting from 2017, a grid or field of grommeted holes physically opening the painting surface is partially covered over by fraying strips of leftover canvas that suggest both censoring and bandaging. Underlying layers of color are visible through cracks, crevices and holes interrupting both surface and grid, revealing a disturbance or rupture, alluding to layers, spaces, voices, and histories buried below as well as body orifaces. For Hammond, “It’s about what’s hidden, muffled, covered up or over, pushing up from underneath, asserting itself, suggesting agency and voice - an interruption of the utopian egalitarian order, but also the possibility of holding together and healing”. Harmony Hammond (b.1944) was a leading figure in the development of the feminist art movement in New York in the early 1970s. She attended the University of Minnesota from 1963–67, before moving to New York in 1969. She was a co-founder of A.I.R., the first women’s cooperative art gallery in New York (1972) and Heresies: A Feminist Publication on Art & Politics (1976). Since 1984, Hammond has lived and worked in northern New Mexico, teaching at the University of Arizona, Tucson from 1989–2006. Hammond’s artwork has been exhibited nationally and internationally in venues such as Susan Vielmetter Los Angeles Projects (2017); Museum of the City of New York (2016); New Mexico Museum of Art, Santa Fe, NM (2016); Museum Brandhorst, Munich, Germany (2015); Rose Art Museum, Waltham, MA (2015); RedLine Art Space, Denver, CO (2014); National Museum of Women in the Arts, in Washington, D.C. (2011); MoMA PS1 (2008); Vancouver Art Gallery, Canada (2008); Museo de Arte Contemporaneo Internacional Rufino Tamayo, Mexico City (2007); Neue Galerie, Graz, Austria (2007); Museum of Contemporary Art, Los Angeles, CA (2007); SITE Santa Fe, NM (2015 and 2002); Hammer Museum, Los Angeles, CA (1996); Brooklyn Museum, New York (1985); New Museum, New York (1982), Downtown Whitney Museum, New York (1978), Walker Art Center in Minneapolis, MN (1968); among others. Hammond’s work is in the permanent collections of the Metropolitan Museum of Art, the Whitney Museum, the Museum of Modern Art, and the Brooklyn Museum, New York; the Walker Art Center, Minneapolis, MN; the Art Institute of Chicago, IL; and the Phoenix Art Museum, AZ; among others. Hammond’s book, Wrappings: Essays on Feminism, Art and the Martial Arts, (TSL Press, 1984) is considered a seminal publication on 1970s Feminist art; her groundbreaking book Lesbian Art in America: A Contemporary History (Rizzoli, 2000) received a Lambda Literary Award. In 2013, Hammond was honored with the College Art Association’s Distinguished Feminist Award. She received both the College Art Association’s Women’s Caucus for Art Lifetime Achievement Award and Anonymous Was A Woman Award in 2014. Hammond’s work is represented by Alexander Gray Associates, NYC. Her third solo exhibition with the gallery will be April 19 – May 25, 2018. The Aldrich Museum of Contemporary Art, Ridgefield, CT, is presenting a survey of her work in March, 2019 and her work will be included in “After Stonewall: Sexual Identity and Politics 1969 – 1989 at the Grey Art Gallery, NYU and Leslie Lohman Museum of Gay and Lesbian Art, NYC, also opening in March 2019.